Our study shows that proton (H+) release during synaptic exocytosis of glutamatergic vesicles produces a fast transient block of presynaptic Ca2+ currents (ICaTB) at auditory hair cell ribbon synapses. 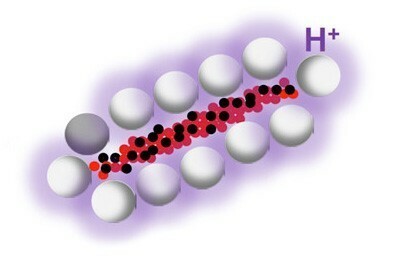 This ICaTB requires a compact organization of the Cav1.3 Ca2+ channels at the hair cell active zone. This process involves a synchronized multivesicular release (MVR) of glutamatergic synaptic vesicles that produces an efficient acidification of the synaptic cleft near the presynaptic Ca2+ channels. 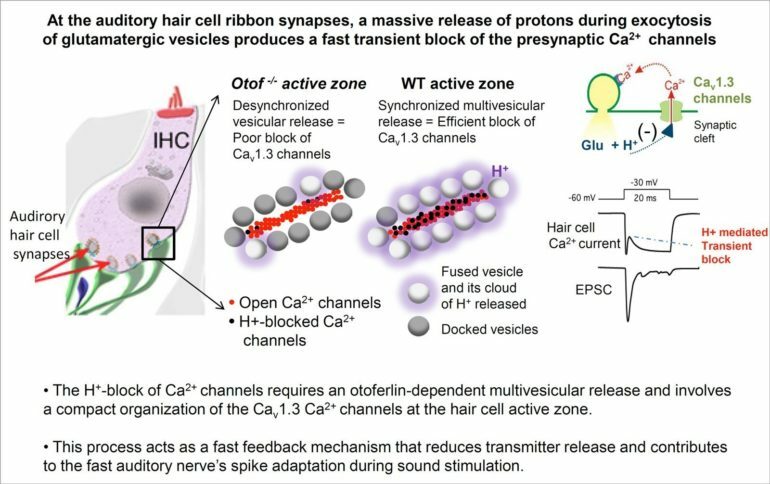 ICaTB is not observed in central neuronal synapses such as the auditory synapse of the calyx of Held where Ca2+ channels, although organized in nanodomains near the sites of release, constitute several topographically dispersed clusters with a rather large inter-cluster distance. ICaTB appears as a specific property of ribbon synapses. Furthermore, our results show that MVR and ICaTB in hair cells is orchestrated by the multi-C2 Ca2+ sensor otoferlin. B. Mazoyer et al dans Genes Brain Behav. La latéralisation du cerveau provient-elle de gènes régulant le squelette des cellules ? Francis Chaouloff et al. in JCI Insight. Comment le cerveau évolue-t-il au cours de la maladie d’Alzheimer ? Inflammation and Depression: A Nervous Plea for Psychiatry to Not Become Immune to Interpretation. Jan Konsman. Pharmaceuticals. 2019-02-14. 12(1): 29. Subjective and physiological response to emotions in temporal lobe epilepsy and psychogenic non-epileptic seizures. Iliana Kotwas, Jean-Arthur Micoulaud-Franchi, Stéphanie Khalfa, Aileen McGonigal, Mireille Bastien-Toniazzo, Fabrice Bartolomei. Journal of Affective Disorders. 2019-02-01. 244: 46-53. Development of a standardized evaluation of endobuccal adverse events induced by repeated tongue protrusion with both a dedicated questionnaire and an endobuccal examination. Cécile Catella, Jean-Arthur Micoulaud-Franchi, Pierre-Jean Monteyrol, Emmanuel Cuny, Olivier M. Vanderveken, Emmanuel d’Incau, Pierre Philip. Eur Arch Otorhinolaryngol. 2019-01-28. .
A Versatile and Open-Source Rapid LED Switching System for One-Photon Imaging and Photo-Activation. Arne Battefeld, Marko A. Popovic, Dirk van der Werf, Maarten H. P. Kole. Front. Cell. Neurosci.. 2019-01-17. 12. Distinct regional patterns in noradrenergic innervation of the rat prefrontal cortex.. Juan-Carlos Cerpa, Alain R. Marchand, Etienne Coutureau. Journal of Chemical Neuroanatomy. 2019-01-07. 96: 102-109.